Stodgy Victorian costumer of cutthroat band headed by nobleman Laughton; O'Hara is lovely, but plodding Hitchcock film is disappointing. 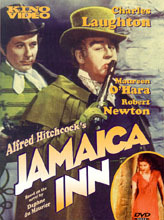 Based on Daphne du Maurier novel; Hitch had far more success a year later with du Maurier's Rebecca . Remade for British TV in 1985.